A long time theme of horror has been that the real fears do not come from the disgusting monster or the axe-wielding maniacs, but from human beings. It is the drive behind zombies, behind Michael Myers, behind vampires. 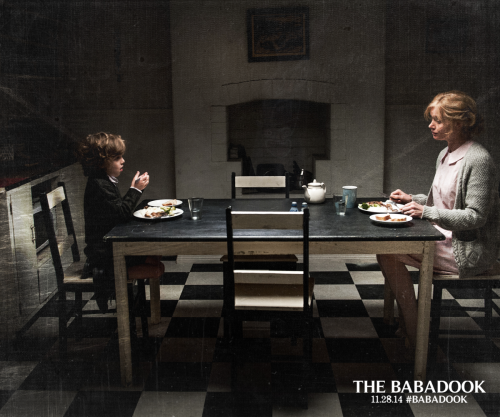 In The Babadook, they take this and distill it, examining one woman and her son as they struggle with a specter that is haunting their lives. But the threat here is not a tall, scary man in black coat, but in what this man actually stands for: Amelia’s grief over the death of her husband and how she refuses to face it. Then these two start being haunted by this terrifying presence. It tortures them, forces Amelia to do horrible things. To kill her dog, to hurt her son, before it is finally beaten back. “She faces it down in her bedroom, house quivering with the force of the confrontation between them.